Sauerkraut and I were kind of destined to find each other. I’ve always had an affinity for briney, salty, vinegary things. Pickles, olives, really sharp cheese…you name it, I want it. The tangy flavor alone is enough to count me in for life but the nutrition profile behind this lovely fermented food is truly the cherry on the cake. Fermentation used to be like, the only way to make foods last. In addition to extending shelf life, fermentation creates the ideal condition for beneficial probiotics to grow. Talk about killing two birds with one stone! Fermented veggies are high in fiber, iron, vitamin C, vitamin K, manganese, and of course, uber duber doo rich in the gut-friendly bacteria we call probiotics. Our gut microbiome, AKA the thousands of different bacteria in our GI tract, influences so much more than what’s happening in the belly. It also plays a role in our immune system, sleep cycles, stress levels, allergies, anxiety, autism, and depression. Nothing fascinates me more in the nutrition world than the gut-brain connection. So it should come as no surprise that I’m PUMPED to chat with you today about getting more of these fantastical fermented foods into your daily diet. 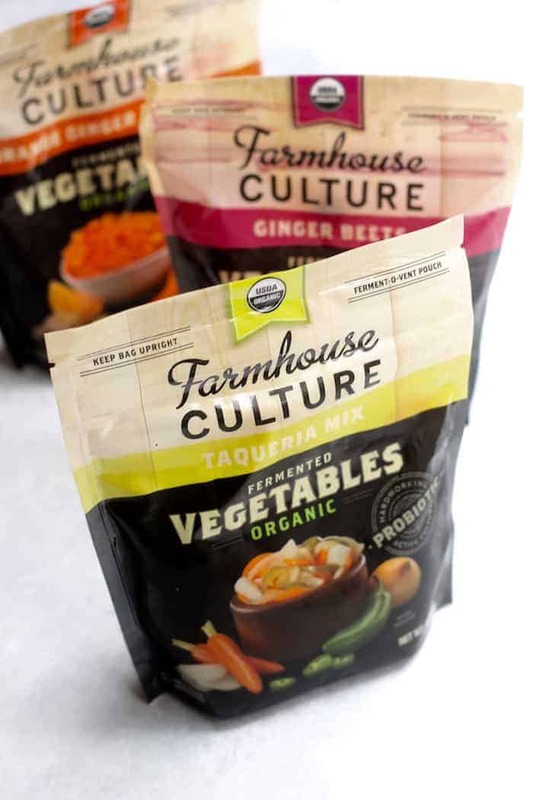 Farmhouse Culture is a stellar company that I first met at FNCE last year. As soon as I tried their Kraut, Gut Shots, my favorite dill pickle Kraut Krips, and their brand new organic fermented veggies I was hooked. The flavor, the texture, the nutrition…it’s all there, my friends. First up we have Asian Sesame Tuna Salad! For the longest time I was mixing together tuna with Classic Caraway Kraut, avocado, Dijon, lemon juice, vegan mayo, dill, and chopped onion. It was and still is the bomb. But last week I made a version with an Asian twist with Orange Ginger Carrots and it brought me to my knees. Feel free to use the measurements as a guide and season to taste. I knew some of you would want actual measurements here so you’re welcome! 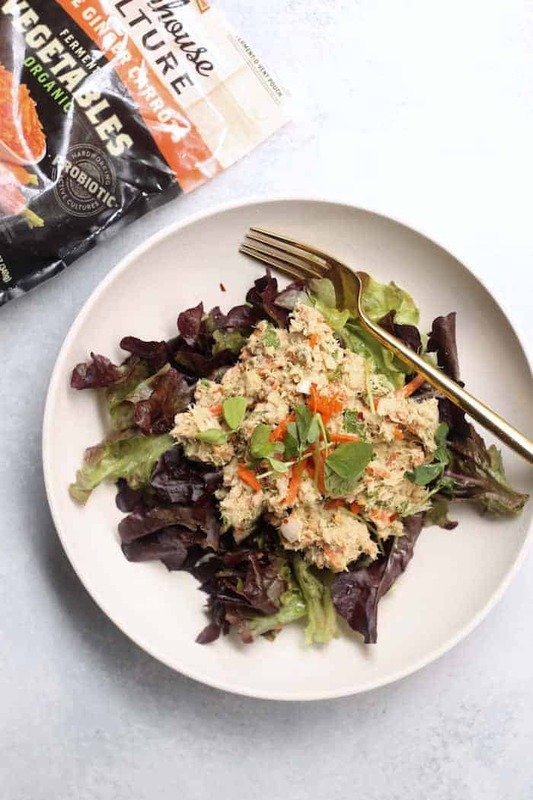 A deliciously healthy spin on tuna salad with an Asian flare! Place all ingredients in a medium mixing bowl, stirring to combine. Serve over greens or on toasty bread! Next up we have Basil Beet Hummus Cakes featuring Ginger Beets! This also doubles as toast. I was digging the brown rice cake for crunch and convenience factor but you do you. The combination of Ginger Beets + basil pretty much blew my mind. Sounds funky, tastes straight up dreamy. And when in doubt…avocado. Toast bread or use rice cake as the base. 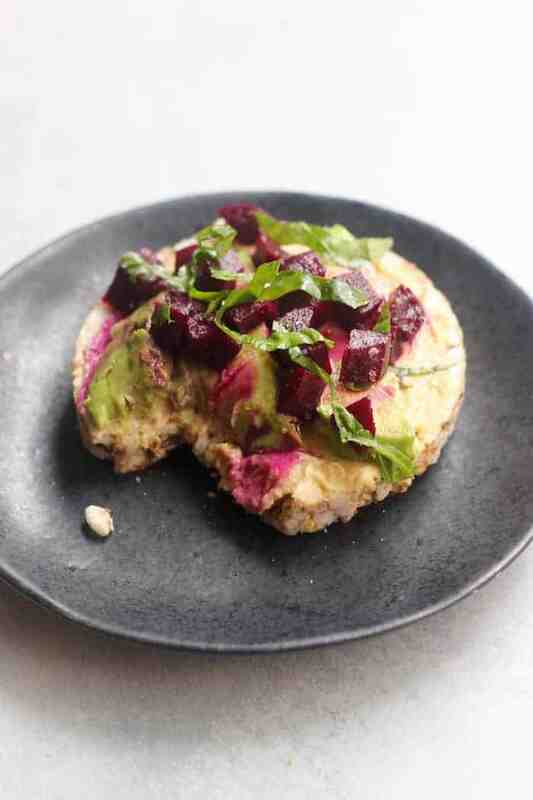 Spread with a thick layer of hummus, sliced avocado, ginger beet kraut, basil, and sea salt. Devour! Last but surely not least, we have my take on nachos. In a bowl. Or make them into tacos. I basically took leftover roasted taco-seasoned veggies, black beans, and corn, topped them with avocado crema, micro greens, and Taqueria Mix and ate it with lotsa blue corn tortilla chips. What a dream! Roast veggies and beans of choice.onion, corn, black beans, cumin, chili powder, smoked paprika, oregano, and olive oil for 25 minutes at 400F. 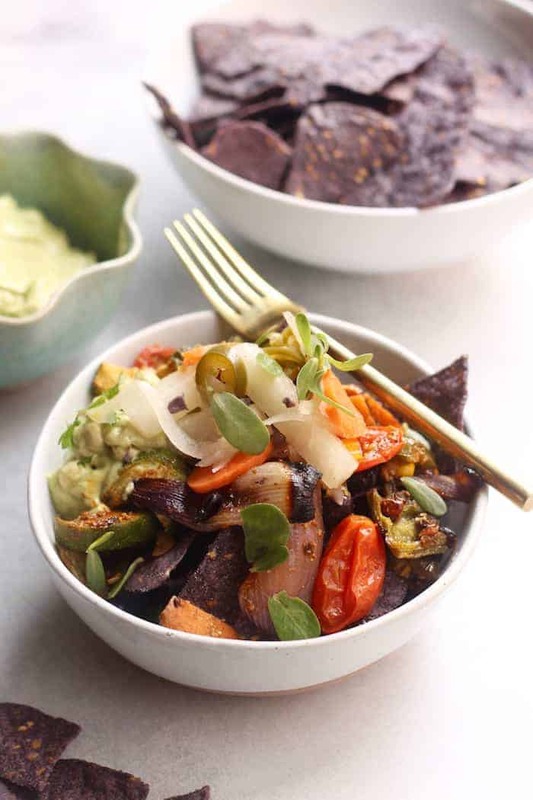 Serve in a bowl topped with avocado, hot sauce, and Taqueria Mix. Use tortilla chips as the vehicle! So there ya have it. Three ideas to get your kraut + fermented veggie on. Now who’s got more ideas to share?? This post is sponsored by Farmhouse Culture. Thanks for supporting the brands I adore and that make Hummusapien possible! I’m addicted to fermented veggies – especially kimchi! I love white rice, so I used to just eat a huge (or two) bowls of rice with plain kimchi for a meal. I never tried using them in any other way. I like the basil beet hummus cake recipe – definitely something I’m going to try out. 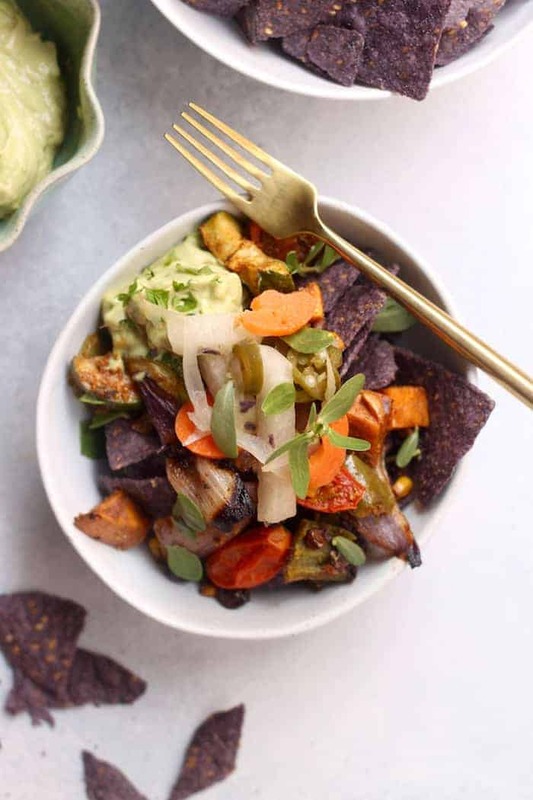 That nacho bowl looks fab! I definitely dont eat any fermented foods righr now, but not opposed! I think the acidity can be too much for me sometimes, but in small doses, Id like them! I feel like sometimes I forget about fermented foods. I definitely wanna try adding more to my meals, not only for the health of it, but for their added flavor and flare. OMGGGG I didn’t know they came out with new products – so excited to try them! Thank you for this! Also – maybe it’s just my computer, but I’m not seeing the Asian Tuna Salad recipe in the post? Just thought I’d mention it in case it got left out. just enter username and then generate free gems for the coc.